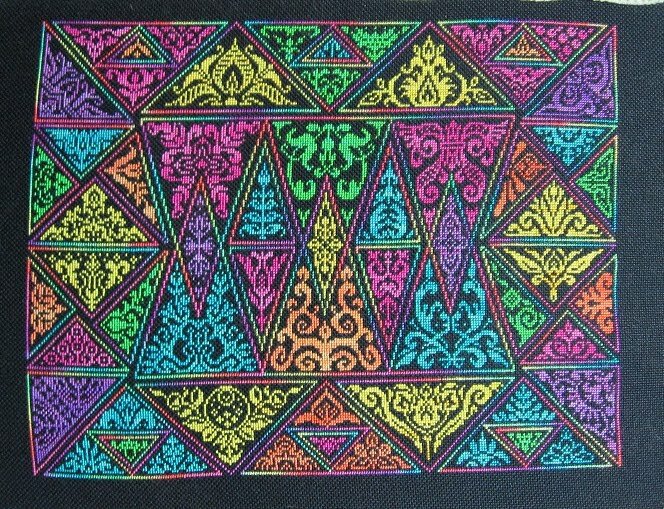 I finished Cirques des Triangles in the wee hours last night! Can't seem to get the right balance to get the colours in the picture accurately - this is without flash, under my daylight lamp, and it's close - but the colours are definitely richer and more vivid IRL if you can believe that! In case anyone is interested in the colourway, I used mostly Gloriana - the variegated is Ada's Rainbow, the purple is Berry Purple, blue is Jewel Turquoise, green is Jewel Green, yellow is Lucky Old Sun, orange is Orange Soda and the pink is Hand Dyed Fibers Hibiscus. Strangely enough, as I neared completion on this one I didn't falter and get distracted as I usually do. 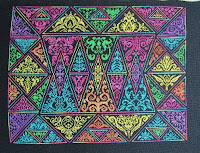 Will have to remember to email a copy of this to Tracy, she always loves to see different things done with her designs. Now I probably should go back to model stitching. I have a couple weeks before the materials for Antique Lace arrive, and maybe 2 or 3 days of stitching left on Daisy, which has to be ready in 4 weeks (so lots of time still). So I might skive for a couple more days and work on something else. Not sure yet. Won't know until stitching time arrives today! This turned out so pretty!! Beautiful! Very striking! I love all the colours on the black! They really pop!